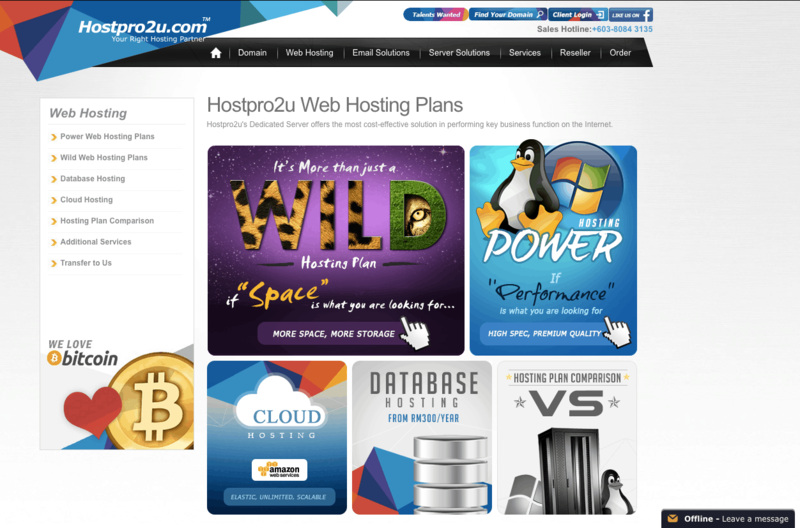 Hostpro2u Review 2019: Is Hostpro2u a Good Hosting? Hostpro2u is a Malaysian web hosting company offering Windows and Linux shared web hosting plans. Advanced coding language support and high entry-level storage capacities are excellent for e-commerce merchants selling in Asia and Australia. Founded in 2009, Hostpro2u is a Malaysia-based company offering both Windows OS and Linux OS hosting services via servers in Cyberjaya, Malaysia. It currently serves over 20,000 customers in locations all around the world. The company was acquired by e-commerce and cloud solutions provider Exabytes in 2018. Hostpro2u’s services and support are offered in English. Hostpro2u prides itself on offering Windows and Linux-based hosting plans that focus on either performance or storage capacity. Every plan comes with 24/7 server monitoring and a 99.9% server uptime guarantee. Daily server backups and firewall protection are also included in all plans. Unfortunately, while three different types of SSL certificates are offered — Thawte, Geotrust, and Symantec — they must all be purchased separately. There’s also no free domain registration offered. Note that while Hostpro2u mentions that it provides all users with a control panel, no specific functionality with DirectAdmin, cPanel, or Plesk is indicated. Unfortunately, no mention is made of integrations other than Adobe Dreamweaver (and only for the Windows OS). Webmasters looking for easy one-click integrations with WordPress, Magento, Joomla, or others will need to look elsewhere. Given the inclusion of advanced programming languages like Perl and Python and lack of Softaculous or any other beginner-friendly tools, Hostpro2u is geared towards more advanced webmasters. That said, while Hostpro2u supports many programming languages, these scripting language versions are rather out of date — it only supports up to PHP 5.3.3 compared to the PHP 7 that many other hosting providers offer, for instance. Still, with its Malaysia-based servers, it’s a good option for medium to large e-commerce merchants with a strong presence in both Asia and Australia to check out. There are five different pricing plans offered for each operating system with Hostpro2u’s shared hosting services. The Windows and Linux versions of the plans offer identical pricing and resource capacities. Three of the plans — Standard, Silver, and Gold — are grouped under the heading “Power” and offer increased performance as you move up through the tiers. The other two — Wild Cat and Wild Lion — are grouped under the heading “Wild” and increase storage capacity as you move up in tiers. The price-to-value ratio as you move up from the entry-level to top-level tiers is excellent. Depending on the feature, both the “Power” and “Wild” plans give you anywhere from a twofold to tenfold increase in capacity for two and a half times the cost. Unfortunately, the absolute price points for the entry-level plans are much higher than what you’d find elsewhere — but it’s worth noting that they come with above average entry-level storage capacities. Beginning webmasters most likely won’t need to pay the premium for space they won’t use. However, advanced webmasters that do need the space will find the relative value of the plans vis-a-vis competitors to be about average. Support options are in English and are about average. You can call their support during normal Malaysian business hours, and I found their representatives to be knowledgeable. 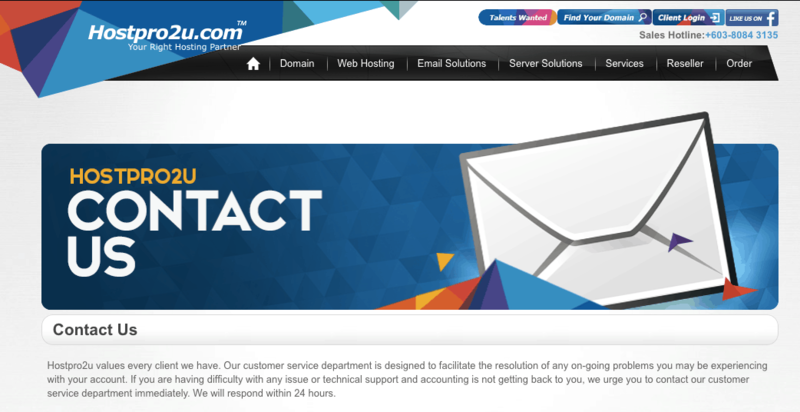 Email support is advertised as 24/7, though they only got back to me within 48 hours. Live chat is also available, although it was always offline on the multiple occasions I checked. Hostpro2u also offers a knowledge base, though the articles seem to be light on the technical aspects of hosting and heavily slanted towards domain registration queries. Hostpro2u offers Linux and Windows-specific plans, a 99.9% uptime guarantee, and support for advanced programming languages. Beginner webmasters won’t need the extra capacity, but e-commerce stores in the Asian and Australian markets can find average functionality and capacity at a decent price-point. Wondering how Hostpro2u stacks up against other Web Hosting companies? Enter any other Web Hosting company and we will give you a side-by-side comparison.